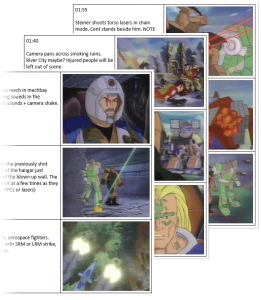 BattleTech: The Animated Series was easily my favorite Saturday morning cartoon growing up (surprised? I thought not). 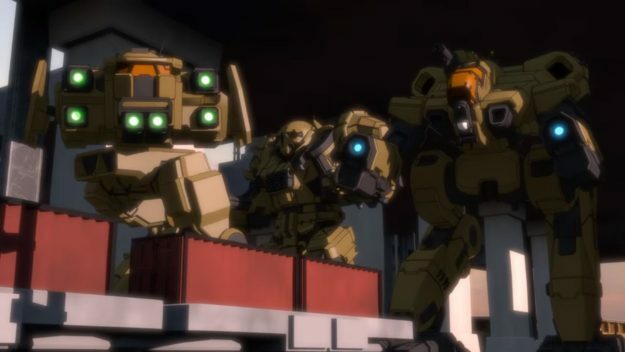 Now it looks like independent YouTube video makers are bringing BattleTech back to our TV screens with a teaser for a new animated series. The teaser is on the Black Plasma Studios YouTube page and is being spearheaded by MechWarrior Online enthusiast RoA Nitrox. Much of what’s on the teaser appears to be taken directly from MechWarrior Online, including the models and sound effects. It looks like they tossed the textures in favor of smoother animation, and it’s really brought these multi-ton death machines to life. 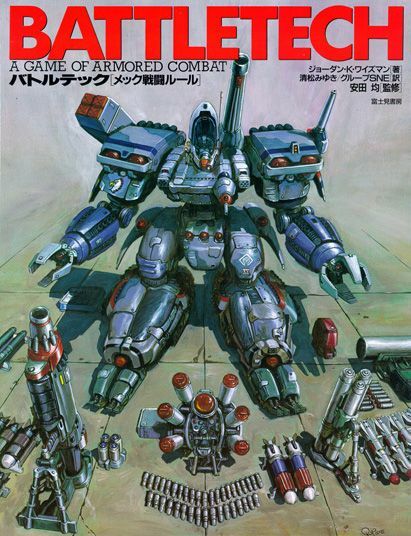 These ‘Mechs move far more fluidly than anything seen in the game and even take part in some hand-to-hand combat. Curiously, it seems like they’re using meta-builds from the game rather than stock ‘Mechs. 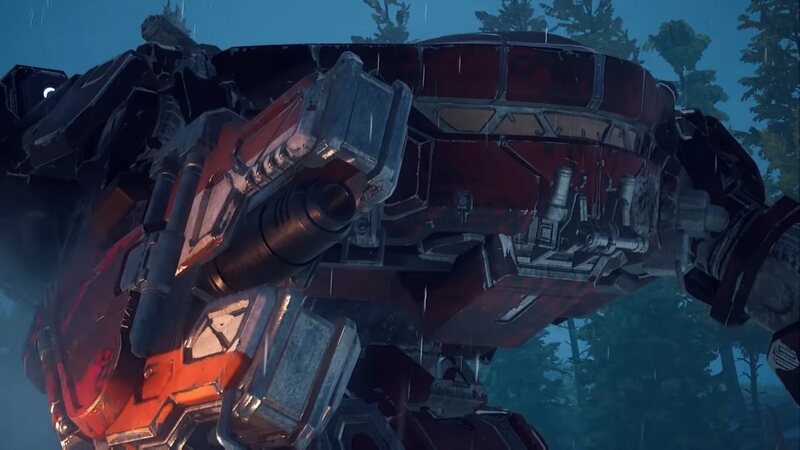 For example, the Cicada shown carries six Medium lasers, while the Hunchback IIC that opens fire on it sports four Ultra AC/2s – known colloquially as a “dakka” build amongst MWO players. The Timberwolf briefly shown appears to be a laser-boat build, while the Dire Wolf is the most ludicrous build possible: 11 ER PPCs. Which, by the way, will shut you down for an entire minute if all fired at once, but only if you don’t immediately explode from the heat spike. Black Plasma Studios seem to typically create Minecraft videos for public consumption as it remains the second most popular video game of all time. The videos are actually pretty good, with silent protagonists and music that’s all top-notch. Their “Blocking Dead” video has over 30 million views, so this is a studio that’s making YouTube money. I don’t think BattleTech can put up those kinds of numbers, but I know I’d love to see some BattleTech animations on YouTube, and I’m sure you would too. So click the link, like, and subscribe to Black Plasma Studios and help this teaser vid become a fully-fledged animated series. This entry was posted in Fan Projects, Videos on 2017/11/30 by Sean. I’ll be honest, I didn’t exactly ‘get’ the whole dating simulator craze. Even when the game speaks directly to me I’d rather be spending my gaming hours in a giant robot dealing death and destruction (or a ninja, or pirate, or something similar). But dating sims? Whatever, man. That stuff is for chicks. Then I saw the trailer for A Locust Love Story and my life will never be the same. Born from the creative genius of MechWarriors Krivvan and Halimede, A Locust Love Story follows young Locust-chan as she attends her first day at River City High. As a transfer student just going into her second year of high school Locust is entering the prime of her combat shelf-life, but she’ll have to be careful. There are mean ‘Mechs at this school, just waiting to eat a tasty little morsel like her for breakfast! She won’t be alone though – Locust will meet lifelong friends who will help her draw strength to overcome the many challenges that lay ahead, as well as have loads of fun along the way. The entire game is built on a visual novel game engine called Ren’Py. The engine is built on the Python programming language and is relatively simple to use. It’s also the foundation for a metric ton of visual novel games, the quality of which will range from something like Locust Love Story to somewhat less reputable titles. As for the workload, it’s a fifty/fifty split between the pair. Krivvan does most of the programming, while Halimede takes care of the visual elements. “Most of the art (besides the title screen, I would like to take credit for that) was Halimede’s thing, and she designed the characters,” says Krivvan. The intro was as simple as adding “some effects like the flower petals”, and then taking some existing sound effects and buttons from MechWarrior Online. “And there are a few surprises planned that I haven’t mentioned yet,” adds Krivvan. 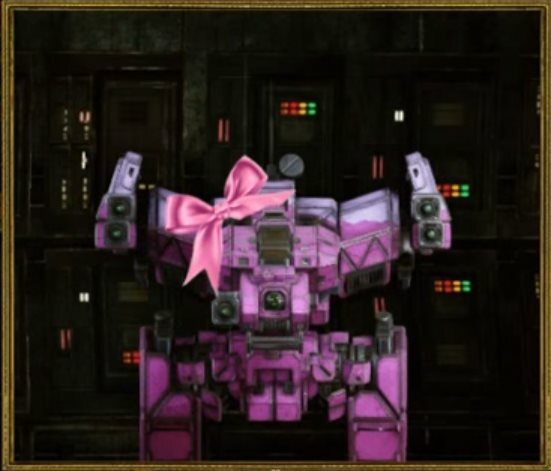 I for one am on the edge of my seat wondering what will happen to Locust-chan next. 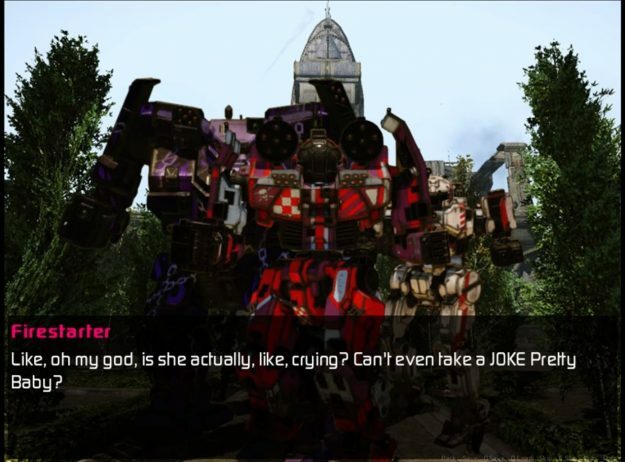 Here’s hoping that Krivvan and Halimede find the time to bring this amazing ‘Mech dating sim to life. This entry was posted in Community, Fan Projects, MechWarrior Online, Video Games on 2017/07/05 by Sean. A lot of us will look back at Saturday morning cartoons from our childhoods and wish they’d bring them back. Sometimes it even happens – just look at Samurai Jack and Power Puff Girls. For most of us it remains just a wistful dream. But not for everyone. Some of us decide to take action. 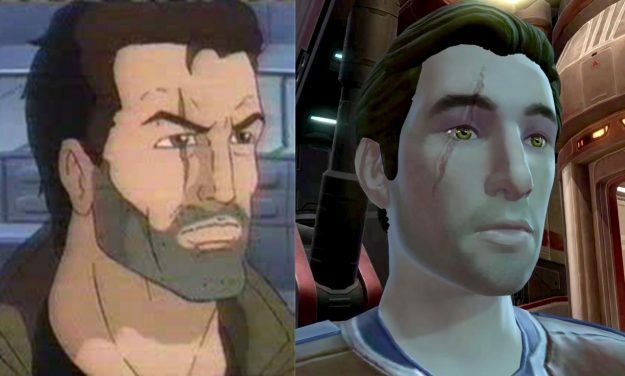 And one of us decided to remake the BattleTech cartoon. I managed to track down the man who spent the blood, sweat, and tears to bring this classic back to life and asked him a few questions on his work. Vux had been a BattleTech fan for a long time. An avid MechWarrior Online player, he’s done quite a few tongue-in-cheek introductory videos for new players on his YouTube channel already. Then, years later, he had an idea to bring back some of that original Saturday morning BattleTech magic. “Then I discovered MWO player Kilroy’s archive of Battletech models and he was cool with me using them in my project,” he adds, proving once again how close-knit the MechWarrior Online community can be. Other scenes, such as the conversation between Andrew Steiner (Adam Steiner’s older brother) and Star Colonel Nicolai Malthus and the establishing shots of the Somerset Military Academy, presented their own difficulties. Once again, video games come to the rescue. The voice acting is intentionally a bit cheesy and somewhat over-the-top, just like in the cartoon. All that was left was months of editing and then it was released upon a wider world. No sir, you rock, Vux. You rock. This entry was posted in Community, Fan Projects, Videos on 2017/04/25 by Sean. Nothing quite beats the feeling of sitting down around a big table with your friends and spending an evening playing tabletop BattleTech. The sound of rattling dice, the camaraderie, the drinking (at least when I do it), and the inevitable hollering that follows when someone bumps into the table and knocks over everyone’s ‘Mechs. Priceless. Sadly this option isn’t available to everyone. Sometimes there’s just not enough people around to get a good playgroup going. 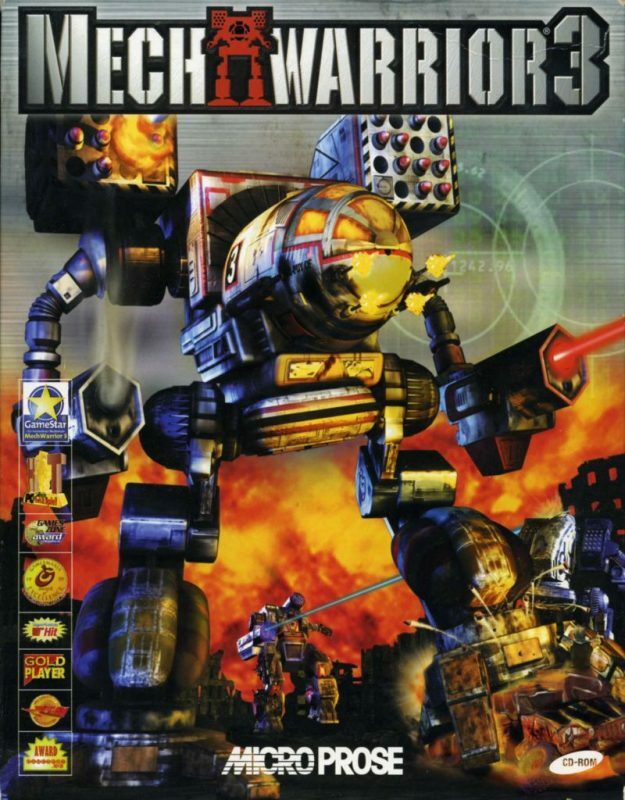 For those ‘Mech heads there’s always been MegaMek to get there giant stompy robot fix, but the virtual world has never really lived up to the meat world in terms of delivering the authentic games night experience. That remained the case until 2015, when a hitherto PC game got some much needed giant robot love. 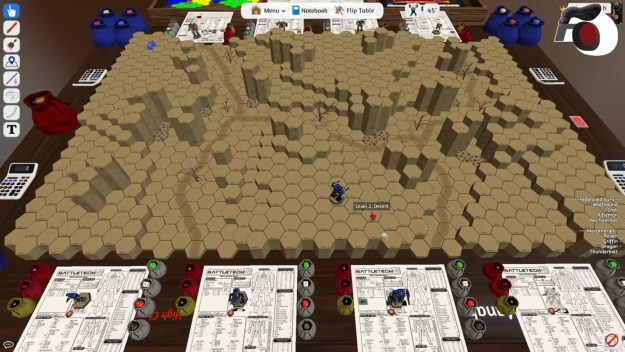 Tabletop Simulator is a game available for download on Steam (or Humble Store or- y’know what? Just go to their website for the full list) that’s really not much of a game at all. It’s more like a physics sandbox designed to mimic real life as much as possible. 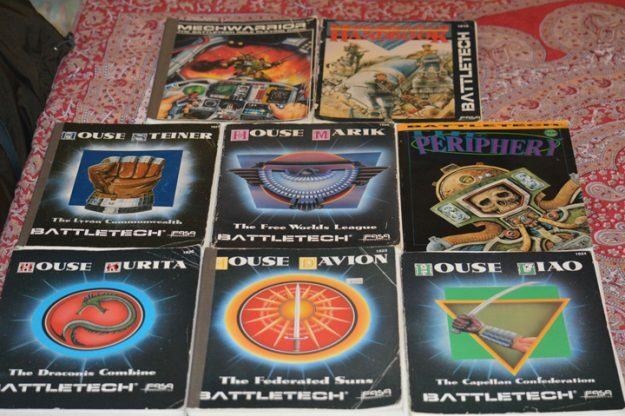 The game comes with a few classic board games (like checkers, pachisi, and go), but in a terrible oversight from the designers, it did not ship with BattleTech as an available game to play. Lucky for us, Tabletop Simulator is easily modified by enterprising individuals with a little modeling experience and a love of the game. 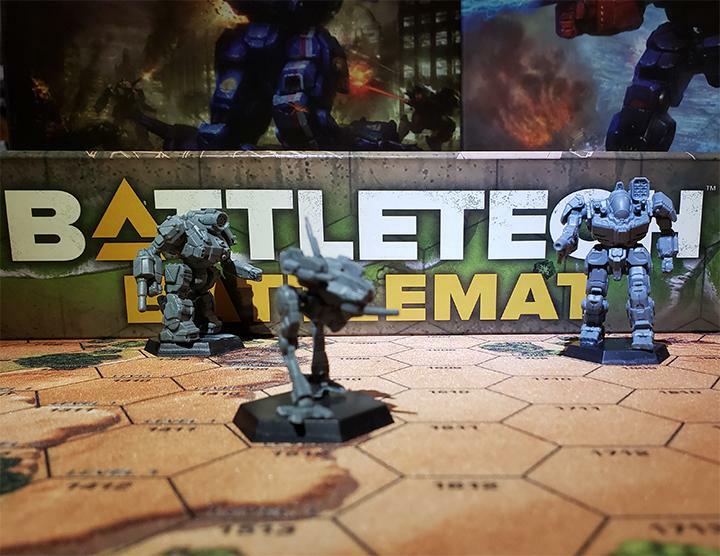 Bringing BattleTech to Tabletop Simulator wasn’t entirely a walk in the park. Because the game has almost no scripting outside of rolling dice, everything that exists in real life has to be made to work in game. That means hex maps, ‘Mech models, even the Record Sheets had to be recreated by hand to work in Tabletop. Fortunately for Turduckens, after the initial release of the hex boards he didn’t have to work alone. “As the word got out it kind of blossomed. 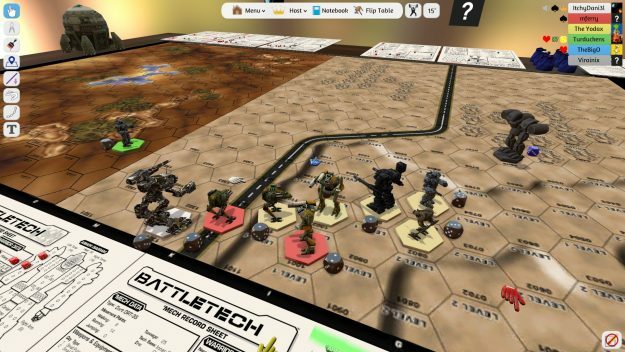 Like, a lot of people started making stuff for Tabletop Simulator,” says Turduckens after his initial release of the BattleTech game boards. Soon a community of user created content would develop around the project, culminating in the BattleTech Collection page under the Tabletop Simulator Workshop. Turduckens curates the page where he compiles and collates all the latest and greatest in BattleTech mods for Tabletop Simulator. And there is quite a lot available. From hundreds of Record Sheets from Steam user Insaniac99, to a full fledged campaign from Steam user WuSu. There’s even other BattleTech games like the TCG and Alpha Strike. 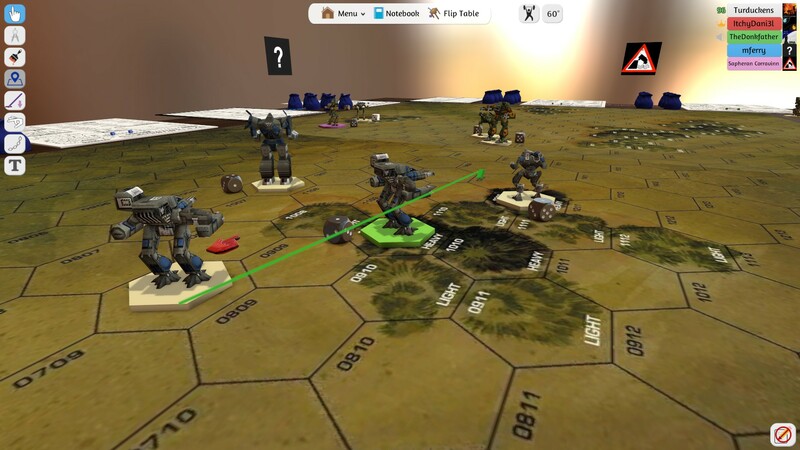 Getting started in BattleTech Tabletop Simulator is easier than ever, with many user created quick-start scenarios. Turduckens has his hosted on Nexus called Davion vs. Mercenaries, a well balanced 4v4 scenario that pits a Federated Suns lance against a mercenary lance of classic 3025 era Battlemechs. For more experienced users, there’s more comprehensive collections such as Steam user ItchyDani3l’s Skirmish, which gives players dozens of ‘Mechs to choose from, both Clan and Inner Sphere. Best of all, Tabletop Simulator has recently gotten VR support, adding a level of immersion never before seen to simulated BattleTech. Turduckens sadly didn’t have a working VR headset to test out his designs, but he did have a friend do it for him. It may be soon that the virtual world will be the space of choice for tabletop BattleTech fans. Until next time, ‘Mech fans. Stay syrupy. This entry was posted in Community, Fan Projects, Software on 2017/04/04 by Sean. Did You Know? – Fan made TRO 3028 is better than the originals! 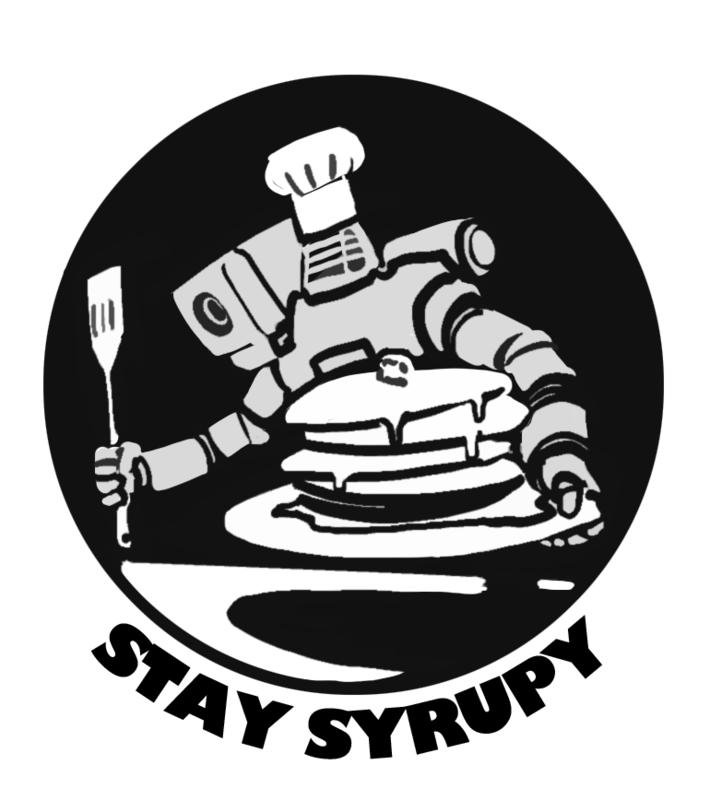 Welcome to Did You Know?, a new column exploring the weird and obscure corners of BattleTech. Today we take a look at Technical Readout 3028, a brand new, fan-made TRO that reimagines the classic Technical Readouts with modern rules and art. Enjoy! 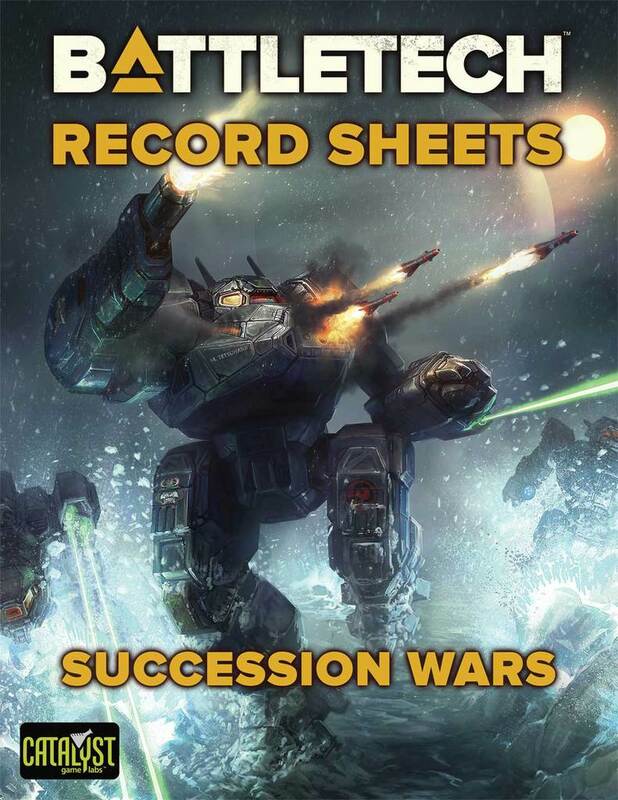 The BattleTech Technical Readouts historically have given every ‘Mechhead exactly what they want; all the numbers that detail the ‘Mech’s in-game performance, a detailed history and backstory, and a big glossy picture. TRO 3028 has all of this in spades, but what makes TRO 3028 so special is not only does it improve on the old school TRO’s by adding modern art and quirks to classic BattleMechs, it’s also completely fan made. TRO 3028 comes from a collaboration of fans, but the driving force behind the project came from one man; Michael Todd. Hooked on BattleTech after picking up TRO 3025 as a kid, he’d always dreamed of making his own Technical Readout. “One of my fondest BattleTech memories is of an old spiral notebook I’d made back in high school called ‘Honest John’s Refits’,” he describes in a nostalgic post on the Harebrained Schemes forums. But work and school would always come first, and time would see Michael playing less and less. Eventually he sold his prized BattleTech collection to make way for a home and a family. Then, years later, a call from an old college friend, and an invitation to a monthly BattleTech game was all it took for the bug to bite back with a vengeance. “Since I’d been away from the game for close to a decade at this point, I had some serious catching up to do.” In a mad frenzy he caught up on the novels that had been published in his absence, repurchased the old TRO’s, and made a tragic discovery. “It was missing all the BattleMechs I grew up with,” he lamented, regarding the loss the “Unseen” ‘Mechs from the modern 3039 TRO. 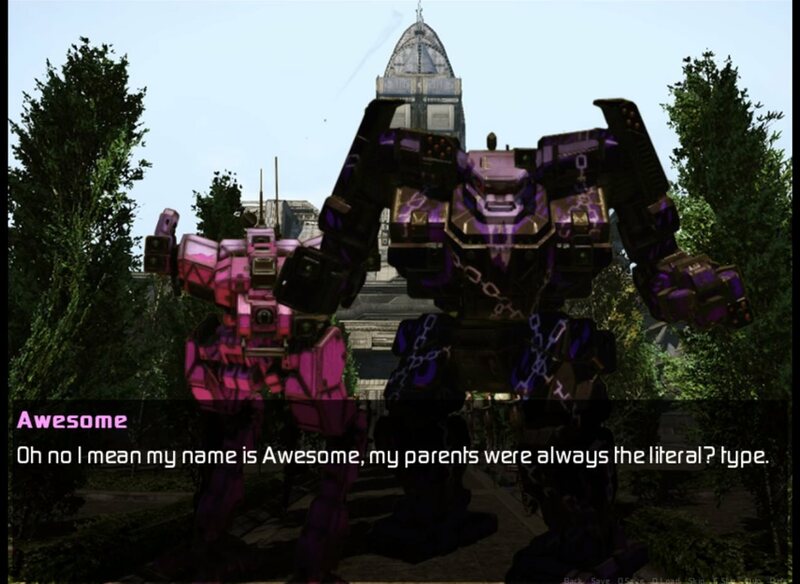 There was one silver lining to be found; “I discovered Alex had re-imagined many of the original BattleMechs for MechWarrior Online.” These modern renditions of classic ‘Mechs were clean, detailed and intricate, far more interesting than the originals. Then with the announcement of Harebrained Schemes upcoming turn-based computer version of the classic BattleTech game, and the “Unseen” ‘Mechs return to the BattleTech fold along with yet more modern art, he knew there was a golden opportunity to recreate that magic he found in the old 3025 TRO. So Michael set to work. 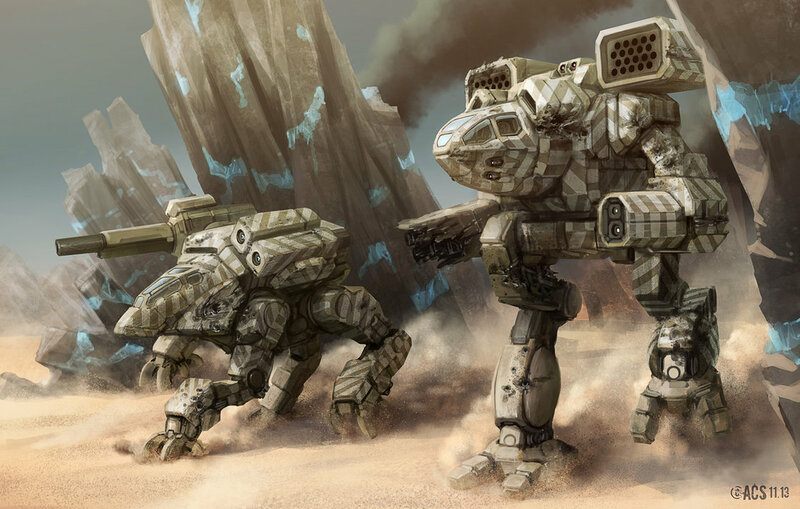 “For a long time I worked in solitude, harvesting art primarily from the MechWarrior Online forums,” but after posting progress on BattleTech forums, it wouldn’t take long for his project to grow. 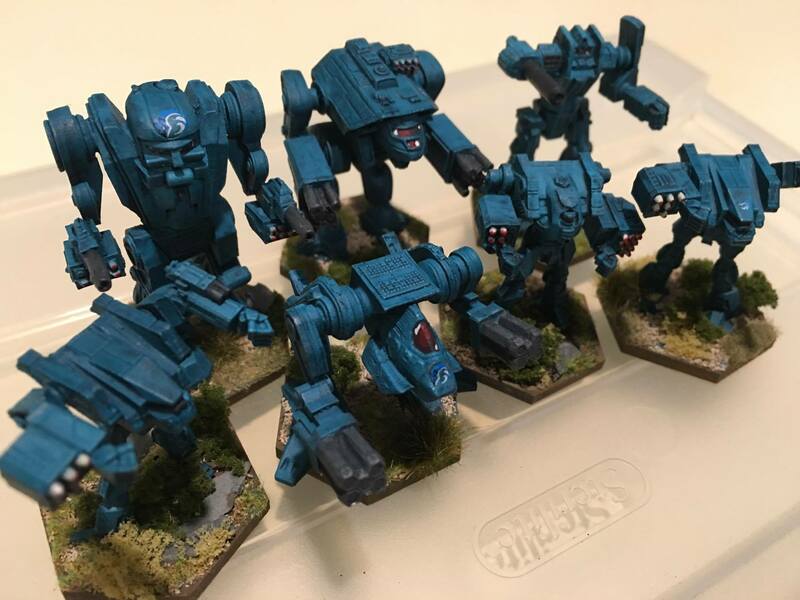 First came Justin Kase, who took the MechWarrior Online art and along Odanan’s templates repainted those ‘Mechs in the style of the old TRO’s, with unit colours and insignias. Then SpOoKy777 became involved by providing full page art spreads to break up each section. Finally after a dozen contributors and editors gave their piece, the dream was realized and TRO 3028 was born. 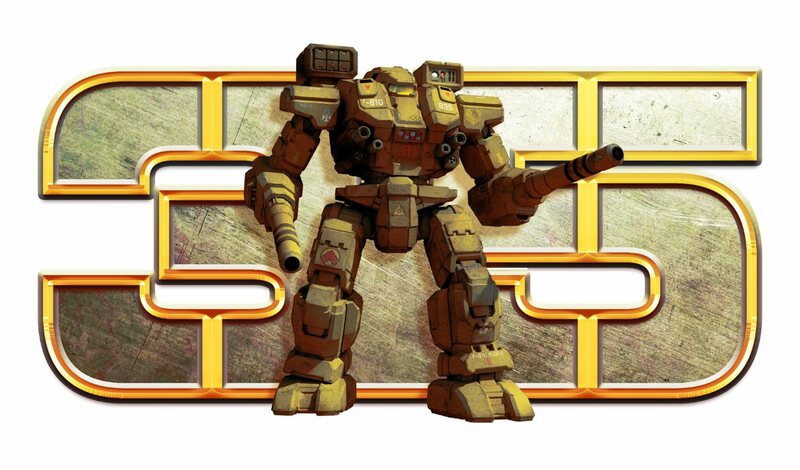 Packed with interesting lore based largely on canonical sources, TRO 3028 is a must have for any fan of BattleTech. 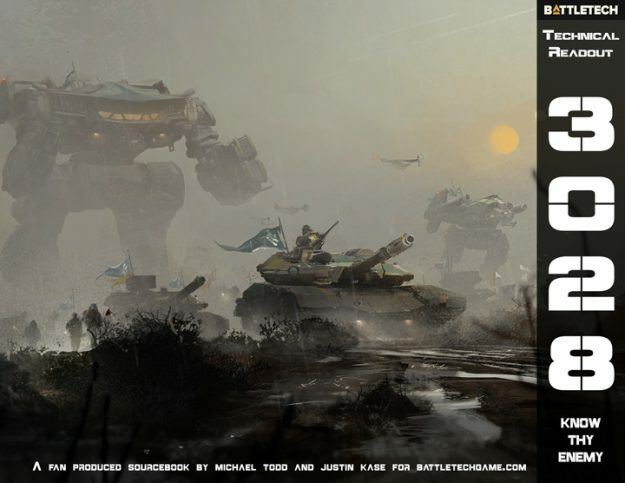 But first and foremost, TRO 3028 is an invitation for players who might not be familiar with the tabletop game to come play classic BattleTech with the ‘Mechs they recognize from modern computer games. Best of all, it’s completely free. Go pick it up. You’re sure to love it. This entry was posted in Community, Fan Projects on 2017/03/08 by Sean. MechWarrior 3 is somewhat unique in MechWarrior series. Whereas in every other game each engagement is a single battle where the player may kill a half-dozen enemy ‘Mechs and then move on, MechWarrior 3 is essentially one long guerrilla operation. In other games, when it’s all said and done you fly away in your dropship, sipping space martinis and laughing merrily at all the whacky robot hijinks you got up to. In MechWarrior 3 you don’t have that luxury – you’re stuck dirtside, on the run, fighting to survive wave after wave of Smoke Jaguar warriors. So how many ‘Mechs did you bust on Tranquil? Reddit user hydra337 has helpfully done the math. Short answer: it’s a lot. Long answer, you destroy 168 points worth of ‘Mechs, Elementals, tanks, and VTOL’s, or roughly an entire clan Galaxy. 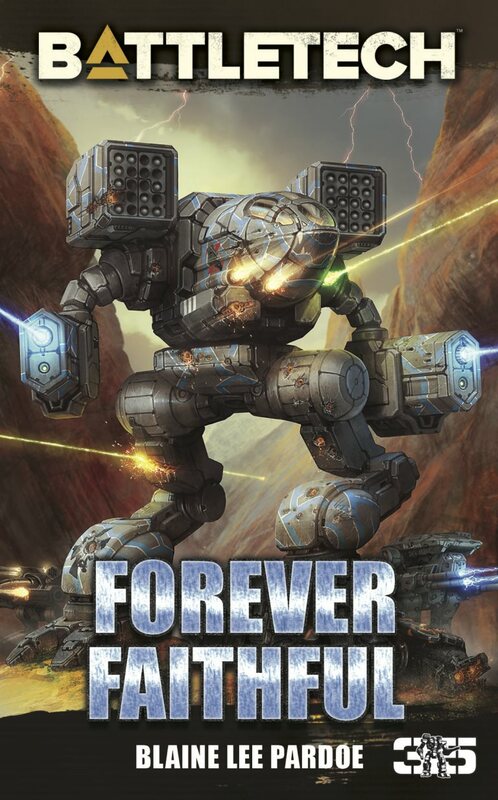 Trial Under Fire, the book based off of MechWarrior 3, is considered the canonical version of events, and in that story Clan Wolf actually does most of the destruction for you. But in our hearts we all know who the real hero of the story is. With much thanks to hydra337 for agreeing to let me post his work! This entry was posted in Community, Fan Projects, Novels, Video Games on 2017/03/02 by Sean. 3D printing is growing both in the areas of industry and as a hobby. Many tabletop gaming players dream of getting a 3D printer and printing up all the models they’ve always wanted. While that may be possible for some, most 3D printing hobbyists can’t afford to by the level of printer that it takes to print models for games like BattleTech. Most of the 3D printers available to consumers are not suited for that kind of detailed printing. That’s not to say that these printers aren’t capable of some amazing things, but usually models in the BattleTech game scale are not something they can handle. So what kinds of things can consumer level 3D printers do? In the roughly six months that I’ve been into the 3D printing hobby, I’ve printed some pretty cool stuff. Statues, terrain, Pokemon, and more. There are a ton of things to do with a 3D printer if you take the time to learn how they work. I don’t know near everything about 3D printing, and I’m having a great time with it. 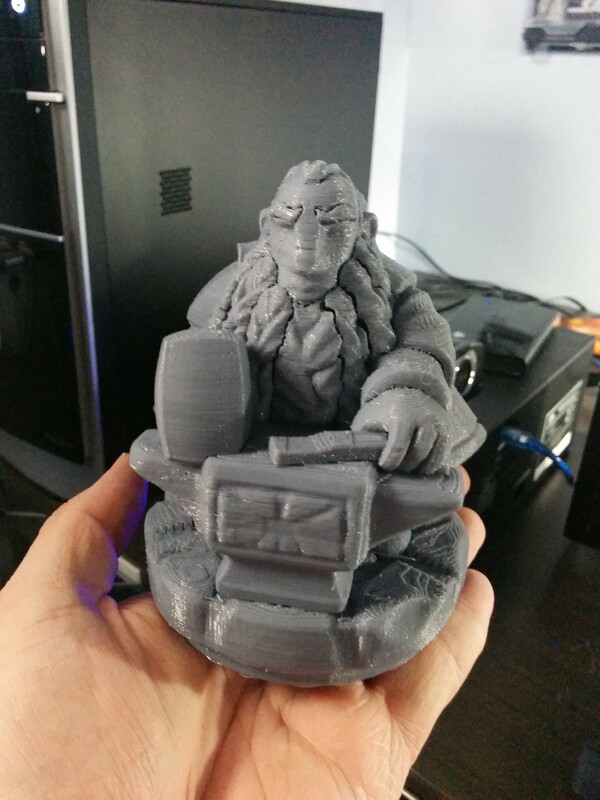 This dwarf statue is but one example of what you can make with a 3D printer. A couple of weeks ago, I was browsing through Thingiverse, which is an amazing website full of free 3D printable files that creators have uploaded to the website to share with the community. As I was browsing I found the page of creator LordNova2 who had shared a couple of really cool MechWarrior and BattleTech related designs. Among those designs was a Clan Ghost Bear medallion. Being a Ghost Bear at heart, I had to download it right away. And then, I completely forgot about it, until a few nights ago. One of my 3D printers (I have two) had just come off a big project I was working on, and I decided to print something fun. I thought I would share the process that followed my decision. This entry was posted in Art, Fan Projects and tagged 3D printing, Clan Ghost Bear, Wanhao i3 on 2016/05/02 by Dave Martin. My local group is partaking in a year-long Leader Board for 2016. Week 6 of the 2016 season kicked off Quarter 2, as players met on Saturday, April 16 for another round of quick and bloody ‘Mech action. Four players descended on the battlefield that day, including a new player who sported the colors of Clan Sea Fox. Due to the nature of this Week’s scenario, players had the option of bringing two rosters, one for Attack and one for Defense. Not everyone did so, but the option was there. Our new player, representing Clan Sea Fox, came prepared for battle with a force of OmniMechs that showed off what a front line Clan force should look like. 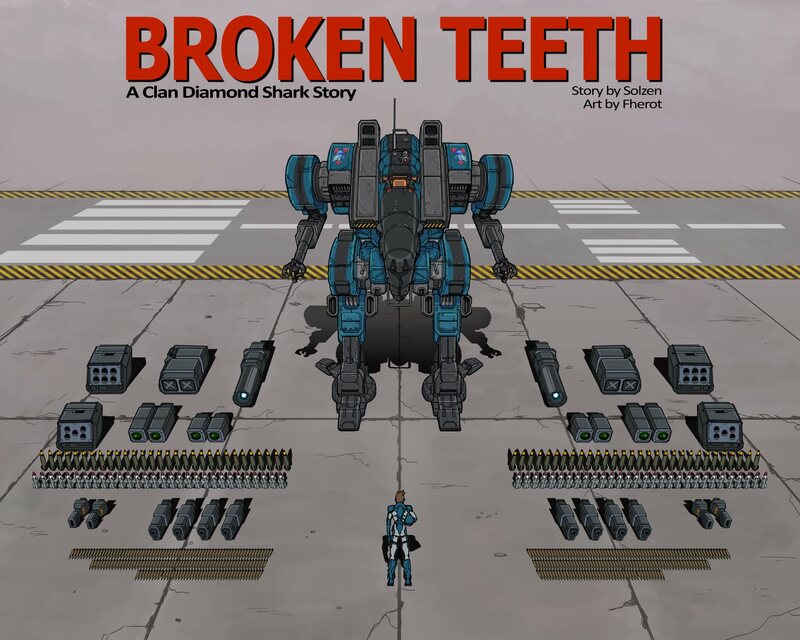 Over a Star of Clan Sea Fox OmniMechs descended on the League. This entry was posted in Battle Reports, Community, Fan Projects and tagged Alpha Strike, BattleTech, Clan Ghost Bear, Clan Sea Fox, Clan Snow Raven, Mercenaries on 2016/04/25 by Dave Martin. My local group is partaking in a year-long Leader Board for 2016. In cased you missed earlier Weeks, here’s Weeks One, Two, Three, and Four. Week 5 for the Leader Board Season was the last Saturday game for the 1st Quarter of the year, and we decided to cap off the accomplishment with a Mega Battle! The lines were drawn between Inner Sphere and Clan, and we all met on Saturday, March 12 to determine which side would reign as Quarter 1 Champions. Each side brought 900PV, split evenly between the players on each side. 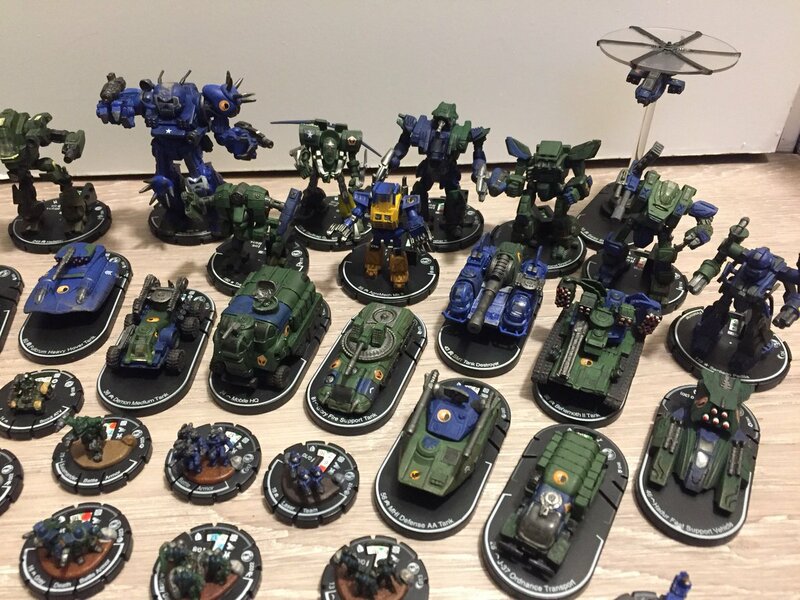 This entry was posted in Battle Reports, Community, Fan Projects and tagged Alpha Strike, Clan Ghost Bear, Clan Jade Falcon, Clan Snow Raven, House Davion, Mercenaries on 2016/03/26 by Dave Martin.